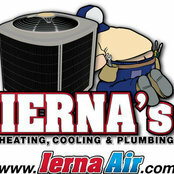 IERNA’s Heating & Cooling is a local, family–owned–and–operated, full service air conditioning, heating and plumbing contractor. We strive for excellence and settle for nothing less. We do this all at a fair and reasonable price for our customers’ sake. Because of our commitment to customer service, IERNA’s has continued to grow every year since IERNA’s Heating & Cooling began in 2003. 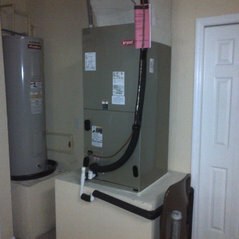 We are EPA, NATE certified and Bryant certified Indoor Air Quality Specialists. Awards Include: 2016 Bryant National Dealer of the Year, Florida Bryant Dealer of the Year, Wesley Chapel Chamber of Commerce Business of the Year; Central Pasco Chamber of Commerce Business of the Year & more. Durchschnittliche Projektkosten:30 USD - 15.000 USDPrice range reflects products, maintenance, service & repairs shown all the way up to installation of complete heating & cooling systems. Seasonal and Energy rebates are available throughout the year. Estimates for new replacement comfort systems and plumbing products are always free with no obligation to buy. See dealer for details.